Prior to the Waterloo premier of the documentary This Changes Everything, a #NoLine9 demonstration was held in the uptown square which called on the Canadian government, the national energy board, and the Enbridge pipeline company to stop moving forward with the line 9 pipeline project until the Chippewas of the Thames First Nation has their demand for proper consultation met. 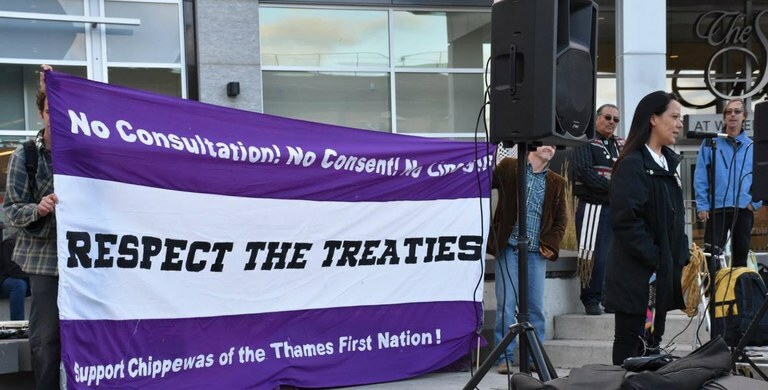 Nov 4 2015 -- Prior to the Waterloo premier of the documentary This Changes Everything, a #NoLine9 demonstration was held in the uptown square which called on the Canadian government, the national energy board, and the Enbridge pipeline company to stop moving forward with the line 9 pipeline project until the Chippewas of the Thames First Nation has their demand for proper consultation met. For more information about the ongoing struggle against the Line 9 pipeline project, and to find out how you can support the resistance, check noline9wr.ca. AW@L Radio is live to air every Friday from 16:00-17:00 on CKMS, 100.3 SoundFM in Waterloo. To support AW@L Radio and the co-op community radio station where we base our work, please visit soundfm.ca/donate.